Optical trapping, developed at Bell Labs in the mid 1980s and known sometimes as "laser tweezers", is a non-contact technique for the manipulation of microparticles by using radiation pressure generated by the scattering of a tightly focused laser beam. Due to its unusual properties, such as the ability to manipulate an object totally enclosed within another object, there are now many wide-ranging applications of optical trapping. Here it fulfils a specific need for a method of non-destructive particle manipulation for use in light scattering studies, where a small object is probed by one laser beam while being held by another one. In this way valuable information can be obtained about, for example, the internal structure of living cells and changes taking place within cells undergoing development or subjected to treatments. 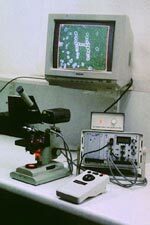 The instrument used for trapping microparticles was designed and built at University of Hertfordshire and was the first self-contained, portable "optical trapping microscope". Since it was first constructed it has been the basis of development work in optical trapping as well as studies on specific applications, such as microbial cell sorting and isolation. Our research also includes the theory of strongly focused Gaussian beams. 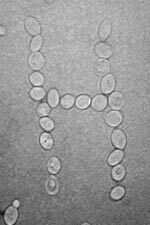 (left) Saccharomyces cerevisiae yeast cells rearranged on a slide using optical tweezers. When carried out by moving a computer mouse controlling the trap position and switching the laser on and off, an operation of this kind resembles dragging icons on a computer screen, and takes only a minute or so. Animated GIF image. 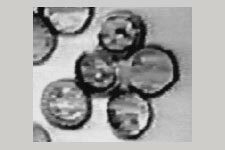 (right) A small cluster of budding Saccharomyces cerevisiae cells rotated using optical tweezers around a point of attachment to a glass slide. The cluster could be rotated indefinitely without breaking the bond. MPEG clip. (left) A Myxomycete (slime mould) spore rotated using radiation pressure - "the water-wheel effect". 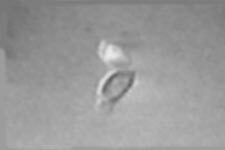 The spore is trapped by its wall and slight optical absorption together with reflection from the reticulate wall allow transfer of momentum from the laser beam, causing the spore to spin - see the MPEG clip. 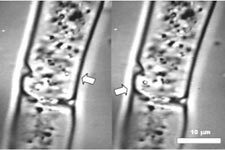 (right) Pair of images showing an organelle moved using optical tweezers within an intact filamentous cell of a green alga Zygnema. The organelle (arrowed) originally visible near the right-hand side of the cell was transferred towards the left. MPEG clip.